Here are some of the things you need to keep in mind when you shoot wildlife. Most wildlife activity takes place early in the morning or late in the evening. During the day not so much. Even if you do find something during mid day the light is very hard. Keep that in mind when you photograph. Knowing the gear, the settings and preparing for the shot. Unlike portrait where you hire a model and practice wildlife does not have an agent you can call to set up a shoot. The next best thing is to shoot street dogs, pets or visit you local zoo. Take the gear you are likely to shoot with and practice. Take shots and see what worked what did not. The camera should become an extension of your hand. You should be able to dial the shutter speed, ISO, f-stop, white balance while keeping in mind composition rules. When you are out in the wild you need be mentally prepared for the moment. 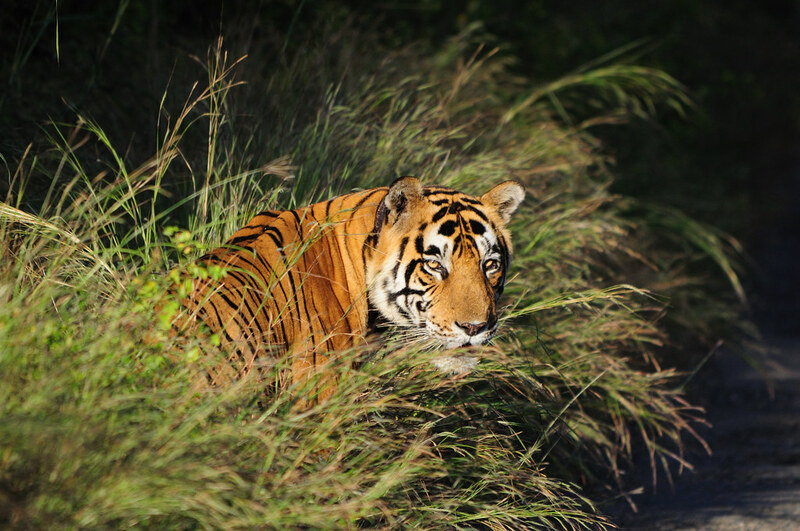 (A personal anecdote) The fist time I saw a tiger in the wild, I could not photograph it. My hands were shaking, I was in awe of this majestic creature and the shots I took were blurry. The second time I did spot one, the same feeling again caught hold of me but because I had some practice under my belt I could pull this shot off. On this shoot there was a friend of mind who came along and we went blank for a moment on his settings. Choice of clothing. This is as important as the others. Get something comfortable. Don't wear clothes that make a lot of noise. Materials which rustle when it rubs against itself, velcro are good things to avoid. Why you may ask, if you happen to be in the middle of your shot and you move, the rustling of your clothes disturbs the animals, the shot is lost. When it comes to colours there are some which agitate the animals don't wear those. Muted colours and colours which blend into the foliage or background are a good way to go. Definitely avoid striking colours. Know the species you are about to shoot. Study is behaviour, its eating patterns, where its most likely to be there. Scout locations if possible or go with people who have scouted the locations already. Patience. Last but not least you'll need plenty of this. Avoid going out with people who don't have this. They will not only ruin your shot but also reduce the possibility of you getting the shot. Clicking nice photograph is difficult thing but editing that photo is more difficult so for that Photo Retouching Services are there who provide services for editing the photograph.